Lew Archer returns in this gripping mystery, widely recognized as one of acclaimed mystery writer Ross Macdonald's very best, about the search for the long lost heir of the wealthy Galton family. Almost twenty years have passed since Anthony Galton disappeared, along with a suspiciously streetwise bride and several thousand dollars of his family's fortune. Now Anthony's mother wants him back and has hired Lew Archer to find him. What turns up is a headless skeleton, a boy who claims to be Galton's son, and a con game whose stakes are so high that someone is still willing to kill for them. Devious and poetic, The Galton Case displays MacDonald at the pinnacle of his form. 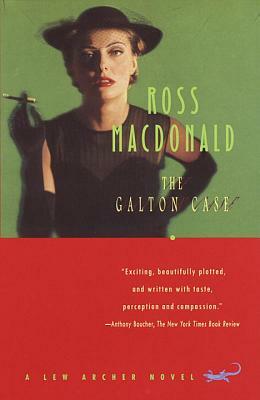 Ross Macdonald's real name was Kenneth Millar. Born near San Francisco in 1915 and raised in Ontario, Canada, Millar returned to the U.S. as a young man and published his first novel in 1944. He served as the president of the Mystery Writers of America and was awarded their Grand Master Award as well as the Mystery Writers of Great Britain's Gold Dagger Award. He died in 1983.